A short cruise is intended as Claire and I have other commitments to attend to so we are taking a short break from the waterways from this afternoon until late tomorrow afternoon, so Enfield is our destination today. 11:30 am we were through lock 15 and 15 minutes later were moored up in Kilcock Village waiting for the lock keeper. This lock 16 and the next lock 17 are actually locks that were locked and we were not allowed to use them by ourselves. 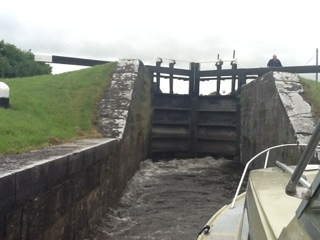 The lock keeper said he would be with us within 30 minutes. The waterways valley through Enfield, below the railway hidden above, is some of the most delightful on the Irish Waterways network. It is a well kept, yet still left natural, valley of mixed hardwoods with a few fairy tales style step down mooring areas. 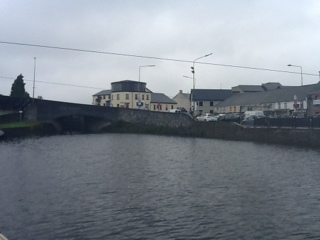 Among this is one of the lovliest Irish Waterways harbours I have seen so far, a clean peaceful place complete with toilets, showers and other useful services tastefully integrated with its surrounding landscape. Sadly we were strong advised NOT to moor there if we were leaving the boat for long as the facilitiy is, apparently, a magent for local destructive people. Boats left alone there for long have been wrecked. This is so, so sad for such a beautiful place. 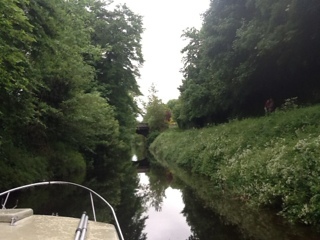 We took the advice given, sailed further upstream and moored hidden among trees in the waterways side woodlands.